We share 13 foods you have to eat when you visit New Brunswick, Canada; from fresh, local lobster to fiddlehead ferns and even tasty seaweed. After a dozen years of living and eating in Europe, we admit, we were spoiled when it came to fantastic restaurants and fresh local produce. So much so, we’d forgotten some of the incredible foods from home. Our time in New Brunswick has given us the opportunity to reacquaint ourselves with some of the delicious Maritime Canadian delicacies we grew up with. But we’ve also had the chance to discover some new-to-us dishes from cultures around New Brunswick as well as some relatively new foods being produced in the province. 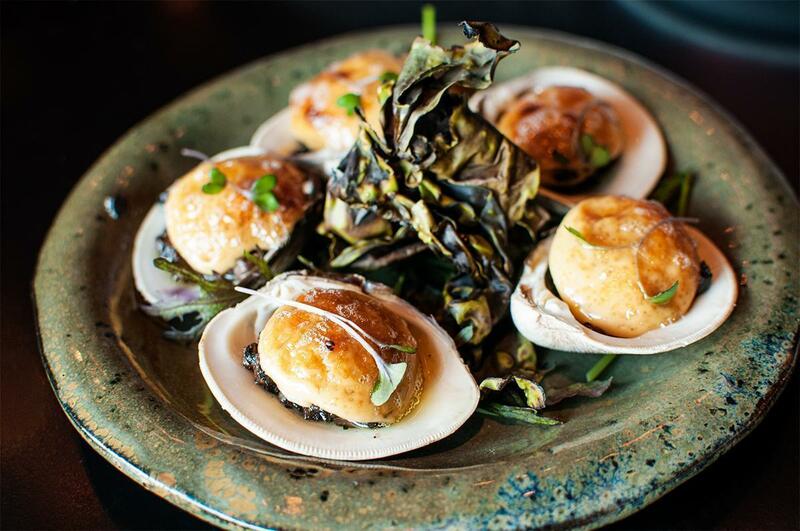 The cuisine of New Brunswick is as diverse as the cultures who settled here; English, French, Scottish, Irish, and of course our First Nations. 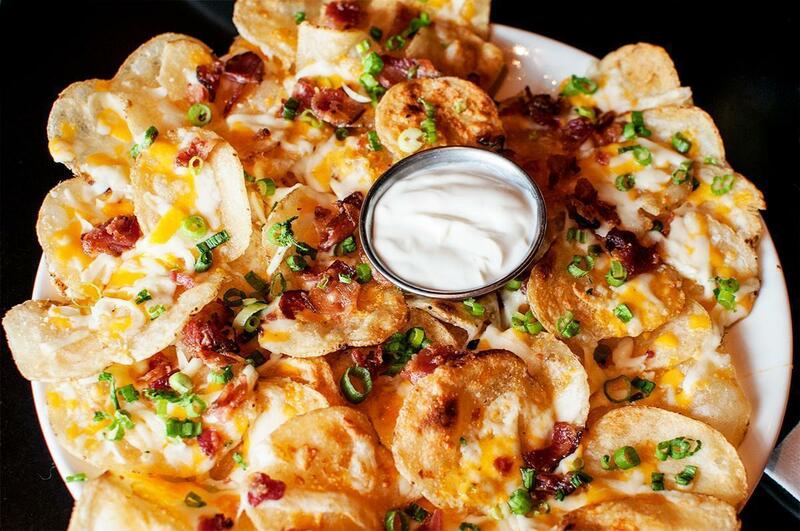 While many of the foods eaten across Canada (like poutine) are found here as well, the province has some local delicacies only found here or in the Maritime Provinces. 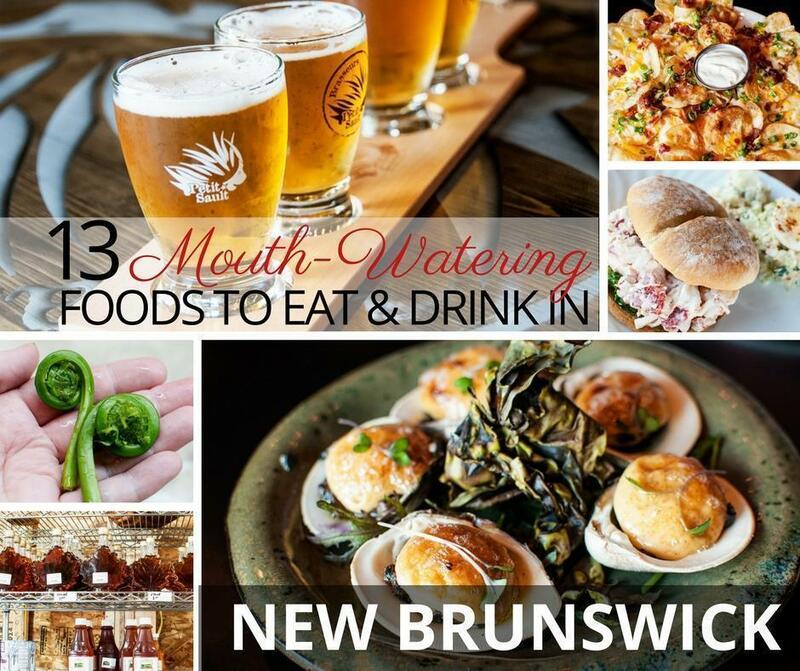 It’s these particular ingredients, dishes, and cuisines we want to share with you, so you can take full (tasty) advantage when you visit New Brunswick for yourself. One of the symbols of New Brunswick (and of the River Valley Scenic Drive) is the fiddlehead. This unfurled fern is foraged in the spring, and the greens are a local delicacy. I remember hating fiddleheads as a child, but as I grew older, the tasty greens grew on me and became something I craved when I was far from New Brunswick in the spring. Fiddleheads have a short growing season and are only found in the wild, making them all the more special. You can find fiddleheads on seasonal restaurant menus in the spring, but for the full experience, you need to go foraging for yourself. (Just make sure you go with an experienced forager as some fern species here are poisonous). 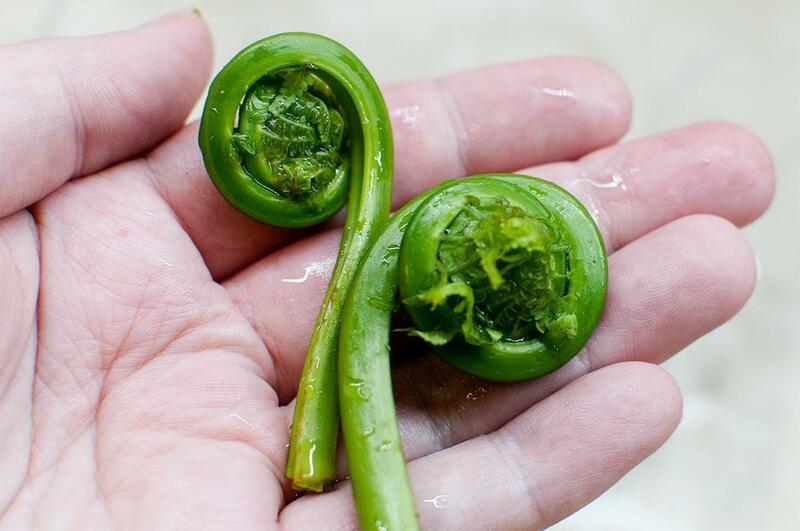 Read about our Fiddlehead Foraging experience near Fredericton. New Brunswick’s Fundy and Northumberland coasts provide the province with a plethora of bounty from the sea. Fish & Chips and deep-fried clams are the local heart-attack inducing staple and fresh seafood features on restaurant menus here at all price brackets; from roadside take outs to fine dining. Our favourite restaurant for seafood in Saint John is the Saint John Ale House where dishes include to-die-for fish & chips and more elevated dishes made for the catch-of-the-day. Ask your server for the daily special and enjoy. The Miramichi River is world famous for its salmon, and fishing the river is a popular pastime. A number of smokehouses have emerged recently, along the Fundy Coastal Drive, selling local smoked salmon and other smoky delicacies. There are however a few treasures from the sea, so important to NB, they deserve their own listings, so you’ll find them below. If you try one food in New Brunswick, let it be our local lobster. There are two seasons here, one in winter and another in summer. The dates vary each year, and the fisheries in different regions of the province are open at various times, so do a bit of research before you plan your trip. The most famous town for lobster is Shediac, owing in part to its giant lobster statue and its week-long lobster festival in early July. While there are plenty of tasty crustaceans available in Shediac, the experience is more touristic. 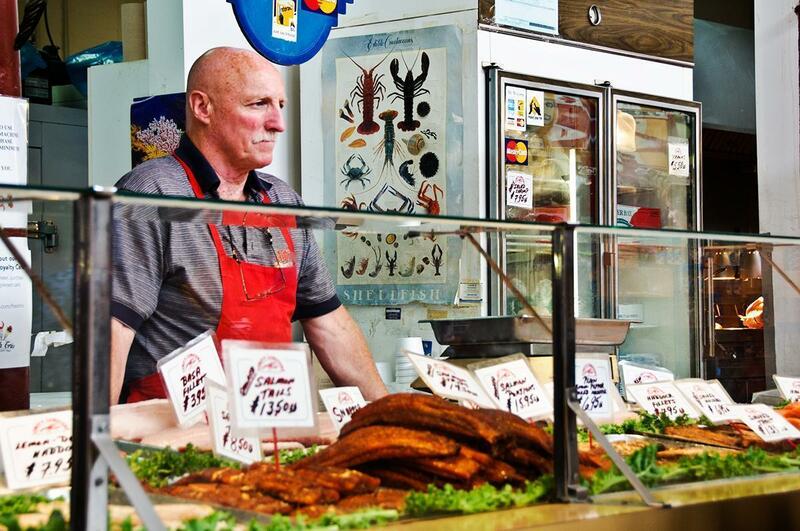 For a more local experience, head to any local lobster pound and choose your own dinner. Many pounds also offer cooked lobster if you can’t toss them in the pot yourself. Our favourite lobster shop is Whitetail Fisheries (also known locally as the Lorneville Lobster Shop or the Lorneville Lobster Ladies), just outside of Saint John. 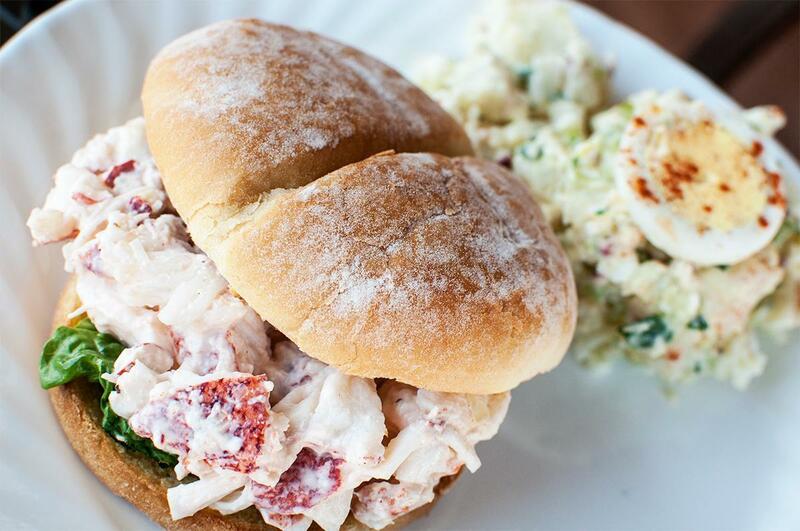 They offer both live and cooked lobsters and make the best lobster rolls we’ve ever eaten. 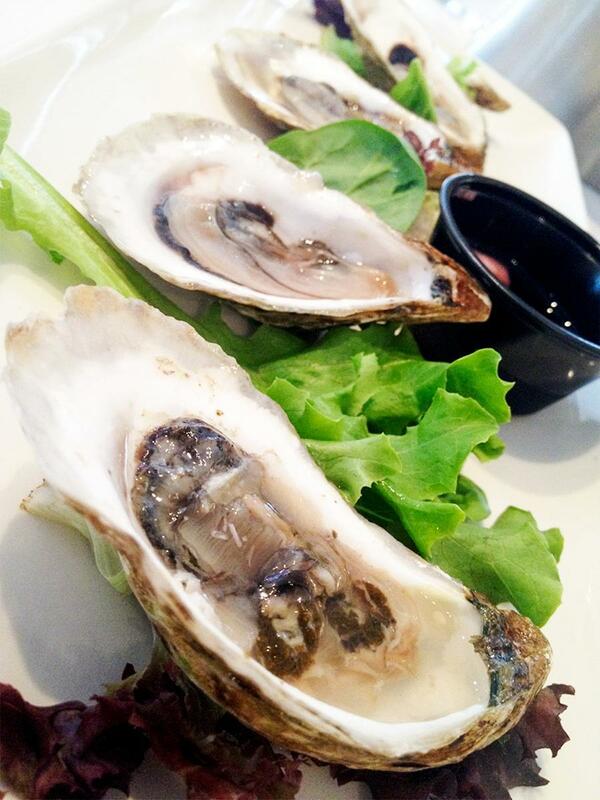 New Brunswick oysters are becoming known around the world. Oysters are comparatively new on the New Brunswick shellfish scene, but the Beausoleil oysters farmed, since 1999, in the sheltered waters of the Northumberland Straight are gaining a global reputation. There are roughly 50 producers on the Acadian Coast working under the Maison BeauSoleil label, and they can be found at seafood restaurants and fishmongers across the province. Other New Brunswick oysters with excellent reputations include Laméque, Peacock Cove, La St. Simon, Village Bays, and Caraquet. Over the past few years, seaweed has become a trendy superfood, eaten for its many health benefits, but New Brunswickers have been enjoying one sea plant as a salty snack for generations. 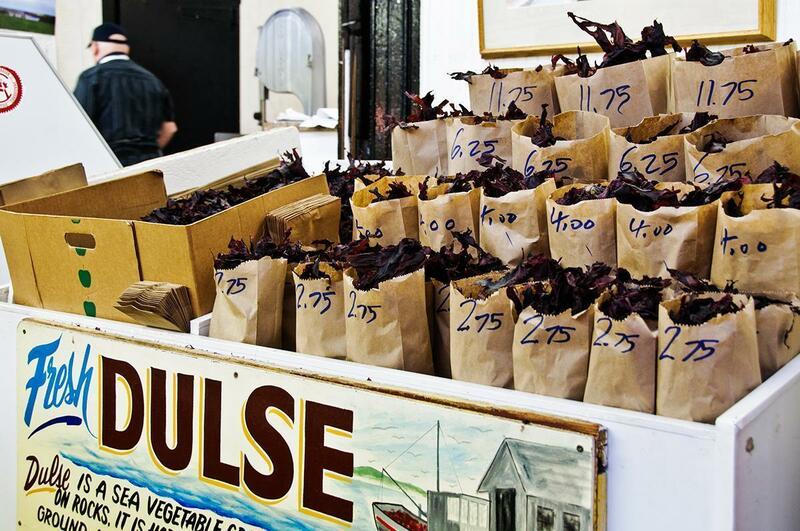 Dulse, palmaria palmate, a dark red seaweed is commonly dried until crispy and eaten like potato chips. It’s a love it or hate it sort of thing (and most folks who didn’t grow up eating it end up in the latter category). Like fiddleheads, I wasn’t a fan of dulse as a child, but I now appreciate it’s salty ‘umami-ness.’ If you can’t stomach a whole mouthful of dulse, you ca still enjoy its many nutrients by crushing it and sprinkling it in soups and sauces. However, it really is worth a second (or third) taste. Buy a bag for yourself at the Saint John City Market. 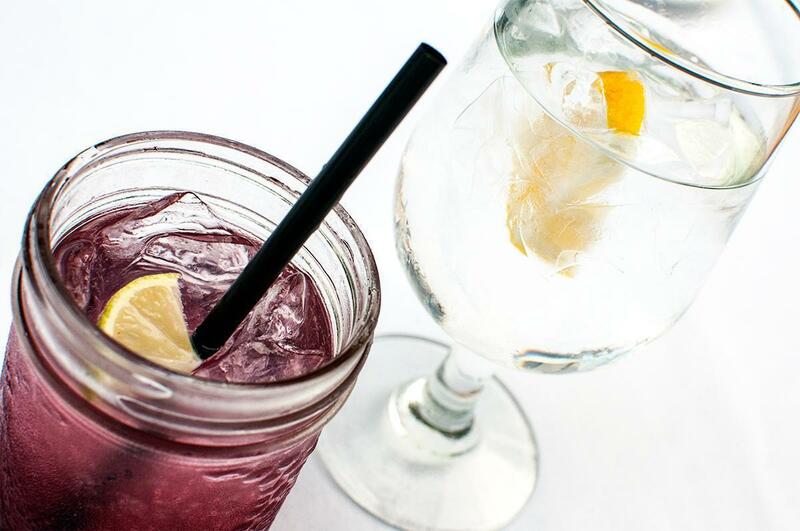 Another New Brunswick superfood is the wild blueberry, bursting with antioxidants and vitamins. NB wild blueberry growers harvest more than 30 million pounds of berries to ship around the world. I have vivid memories of trekking to my Grandmother’s favourite (closely-guarded secret) blueberry picking spot and battling blackflies and mosquitos to pick a bucket of berries. It would have been faster picking if more ended up in our bucket than my face, but at least I was getting plenty of antioxidants! You don’t have to battle nature to get your hands on blueberries in NB. You’ll find them at roadside stands, markets, groceries, and on restaurant menus throughout the season. In addition to fresh and frozen berries, you can sample blueberry syrups, jams, jellies, vinaigrettes, and even blueberry wine. 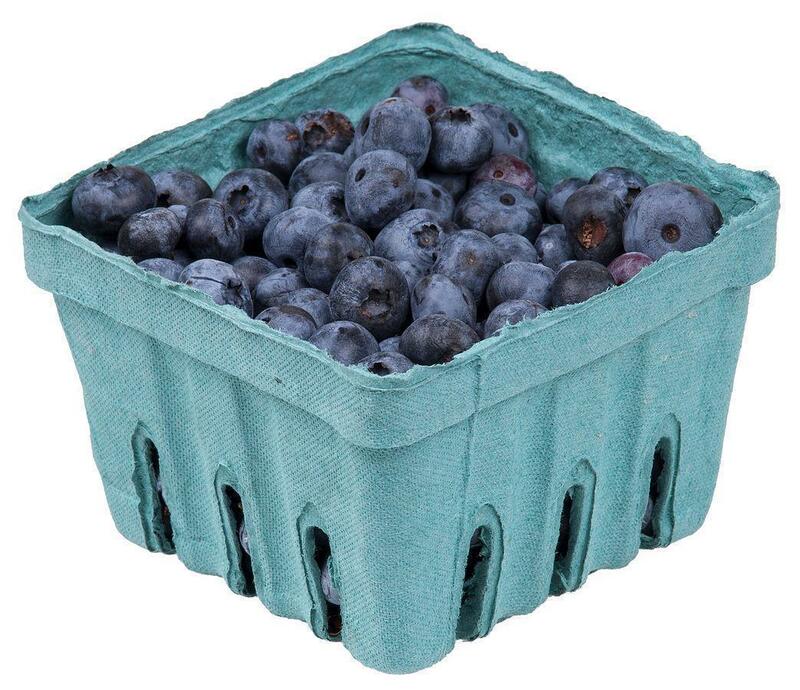 If you do want to experience picking berries yourself, visit in mid-August to mid-September to taste blueberries fresh from the bush at one of many local U-pick farms. Canada is known around the world for its excellent maple syrup, and New Brunswick produces 1.8 million kilograms of this liquid gold each year. While we love our syrup, it’s not the only maple product on offer in NB. Maple butter, maple sugar, maple candy, even maple cotton candy are some of the sweet treats you can enjoy in the province. You can buy NB maple products year-round but the best time to get the full ‘maple experience’ is when the sap starts running in early spring. 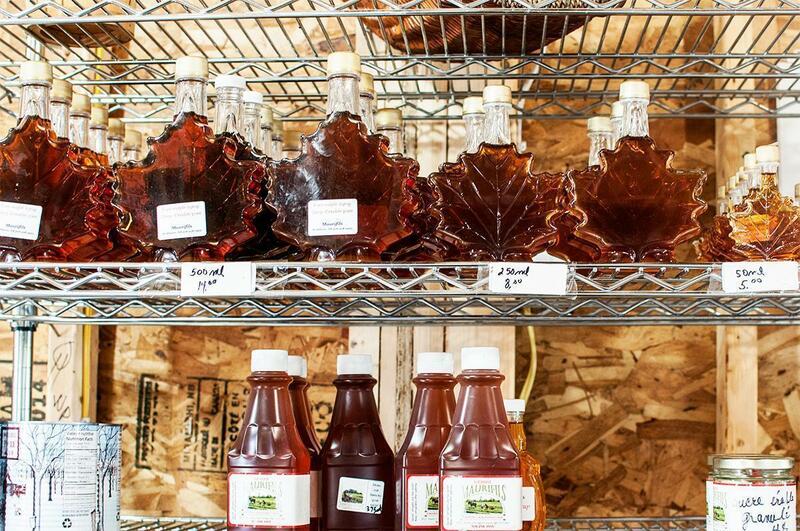 Half a dozen maple producers around the province offer a ‘sugar bush’ experience where you can visit during the harvest and enjoy the maple-goodness onsite. Crispy kettle chips made with New Brunswick potatoes. New Brunswick’s primary crop is potatoes, and the centre of the province is potato country. NB produces 20,000 hectares of potatoes, and more than half are sent for processing into a variety of potato products from fries to chips. The humble potato is so important to New Brunswick agriculture we have a potato research centre, near Fredericton, and a potato museum, Potato World, in Florenceville-Bristol. Florenceville is known as ‘the French fry capital of the world’ as it is home to McCain Foods, one of the world’s biggest frozen fry producers. We still remember seeing signs for McCain fries on our first trip to the Netherlands and coming to the realisation our ‘little’ New Brunswick company wasn’t so little after all. I have a weakness for potato chips, and while any bag of grease and salt will do in a pinch, my new favourites come from a small New Brunswick company. Covered Bridge is located in Hartland (famed for the world’s longest covered bridge), and you can tour the small family-run factory. All of the Russet potatoes come from a farm down the road, and the skins are left on for extra nutrients. Their chips come in New Brunswick-y flavours like Donair and Lobster, but my personal favourites are the classic Atlantic Canada’s Choice Thick Cut (with sea salt) and the Sweet Potato and Sea Salt. While many of the staples on Anglophone tables come from our British and Irish ancestors, Francophone New Brunswick has its own cuisines. The Acadian French of the Northumberland shore have signature dishes like chicken fricot, a stew with fluffy dumplings, and rappie pie, a heart-stopping concoction of ground meat and potatoes. Cruise the Acadian Coastal Route and stop at any of the small family-style restaurants and you’re in for a treat. Craft breweries are popping up all over the globe, and New Brunswick is no exception. 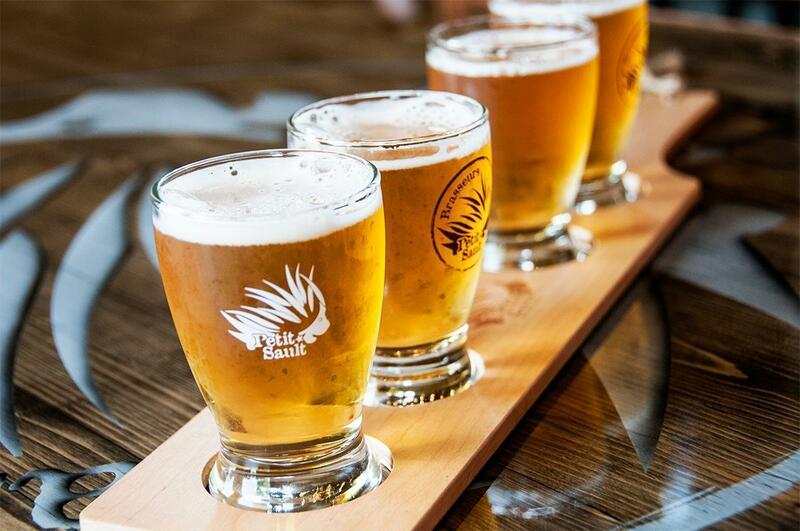 While you can find craft beer from Edmundston to Saint John and all points in between, Fredericton has been the epicentre of the provinces craft brew movement. Fredericton’s annual craft beer festival highlights beer (and cider and mead) from around the province and the Maritimes, and there are so many breweries in the city centre several tour initiatives are being finalised (so watch this space). 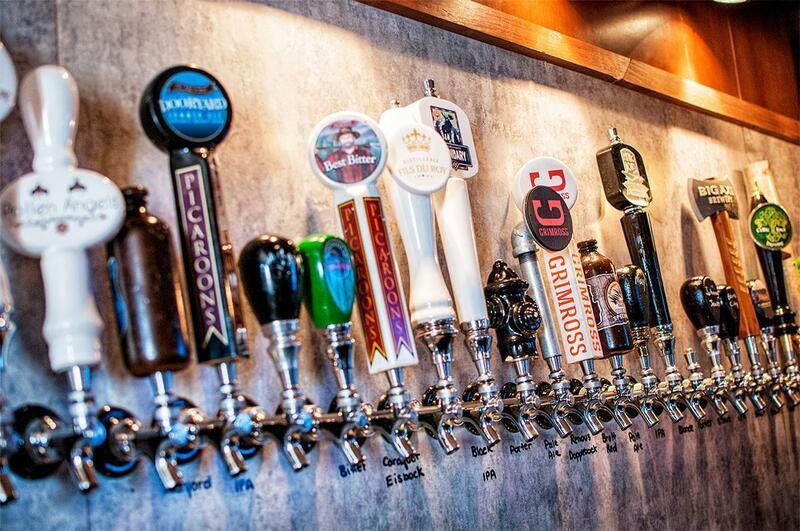 Visit the James Joyce Pub at the Crowne Plaza in Fredericton for the province’s largest selection of local brews. 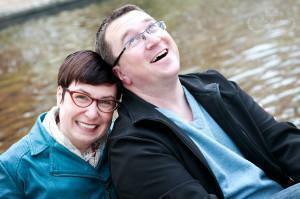 Beer isn’t the only thing brewing in New Brunswick. 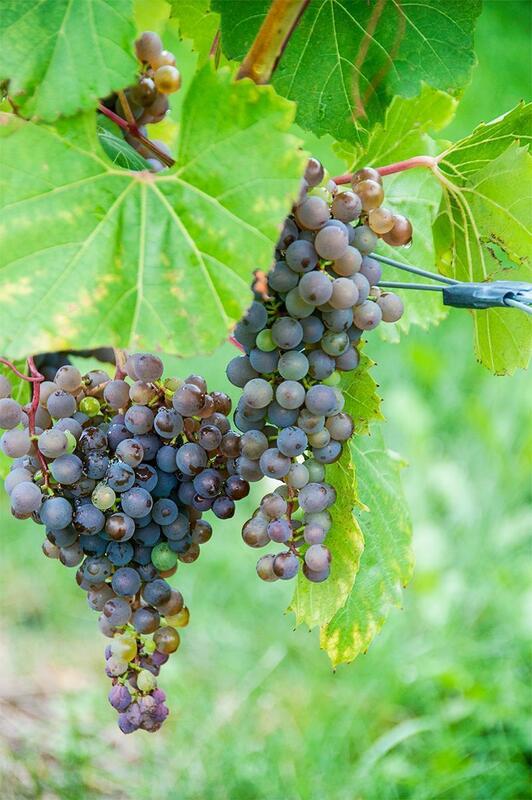 Wineries are relatively recent in Eastern Canada and in New Brunswick they are still quite small scale, but that doesn’t mean they aren’t worth discovering. We enjoyed a tour and tasting at Richibucto River Wine Estate, in Rexton, where we loved their unique, dry, red wine, Carmine. We’ve also had some excellent bottles from Motts Landing Vineyard in Cambridge-Narrows. For something a little different, a variety of fruit wines are made in NB made from apples, pears, currants, cranberries, and blueberries. Due to their low alcohol content, many of these can even be found in NB supermarkets. New Brunswick is also home to a Meadery called Sunset Heights, where they produce sweet wines from honey. Sunset Heights offers more than a dozen varieties including meads made with apples, berries, and other botanicals. We’ve tasted several of Sunset Heights meads at the Craft Beer Festival and at the Crowne Plaza in Fredericton where they donate honey from their rooftop hives for their own special mead. If wine and beer weren’t enough, NB currently produces our favourite gin (and believe us, we’ve done a lot of comparative tasting). Distillerie Fils du Roy, in tiny Petit-Paquetville, NB, produces a variety of spirits including whisky, vodka, absinthe, as well as blueberry, cranberry, and anise/vanilla liqueurs. Our favourite, however, is their Gin Thuya, a liquorice-y gin we adore. We’re not alone; Gin Thuya has won gold medals at numerous international spirits awards. We haven’t yet visited the Distillerie in person, but it’s on our NB Bucket List so watch this space. It’s possible we may have referred to New Brunswick as a ‘cheese desert.’ (Ahem) However, we have discovered one fantastic goat cheese farm that’s worth a trek to ‘the middle of the woods’ to discover. 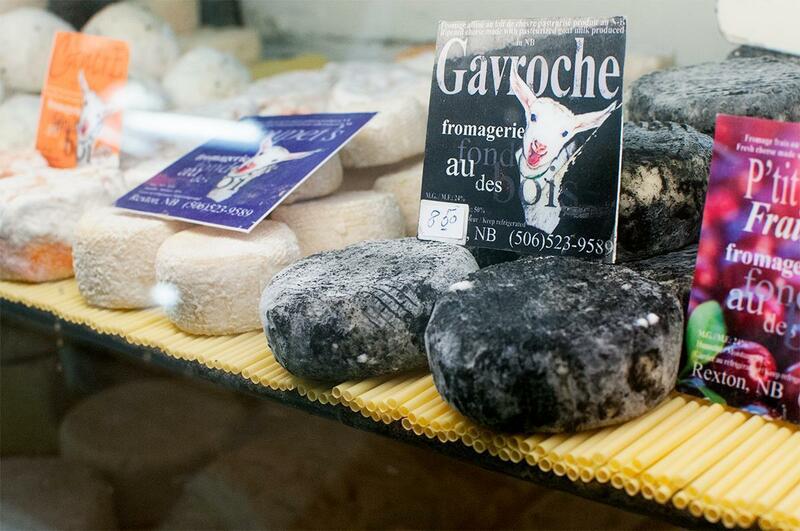 Fromagerie Au Fond du Bois produces dozens of varieties of goat cheese from their herd of 200+ friendly goats. You can find them at a variety of the province’s farmers’ markets, including the Boyce Market in Fredericton, but if you’re on the Acadian Coastal Route, near Kouchibouguac National Park, they are worth a visit in person. Stop at nearby Richibucto River Wine Estate (above), and you have the makings of a great picnic. 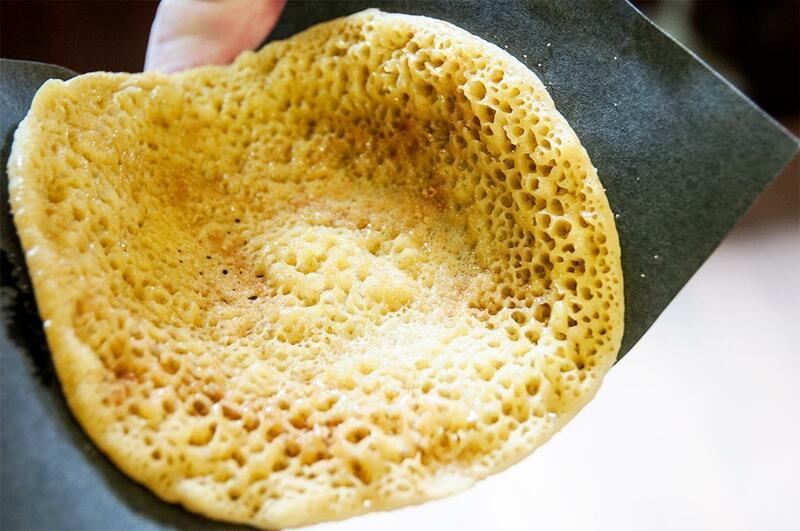 These are just a few of the delicious foods you’ll find on your plate in New Brunswick. In our past year here, we’ve seen innovative locals producing traditional favourites at world-class standards to new and innovative crops never before seen in Eastern Canada. 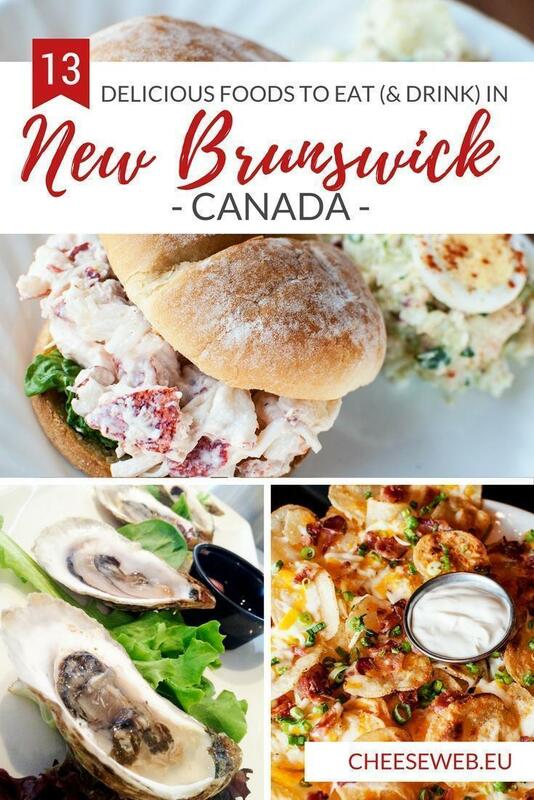 We’re not sure what the future holds for New Brunswick cuisine, but we do know it’s going to be delicious!